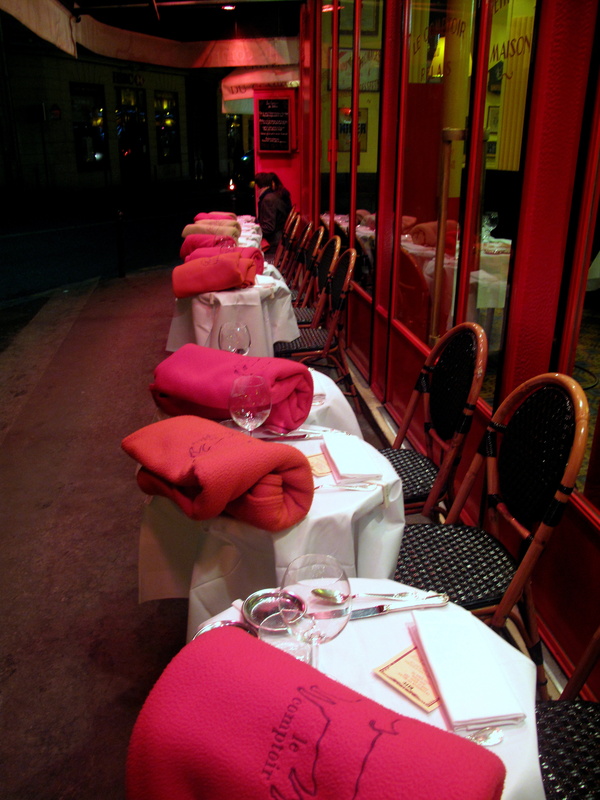 There is some contention as to when and by whom the renaissance of France’s bistros was begun. It can be argued that Michel Rostang was that who and the late eighties was that when; in 1987, this chef opened Bistrot d’à Côté Flaubert next door to his main restaurant. He was very quickly followed by Guy Savoy and then a little slower by Jacques Cagna, Gérard Boyer, Marc Meneau and others. 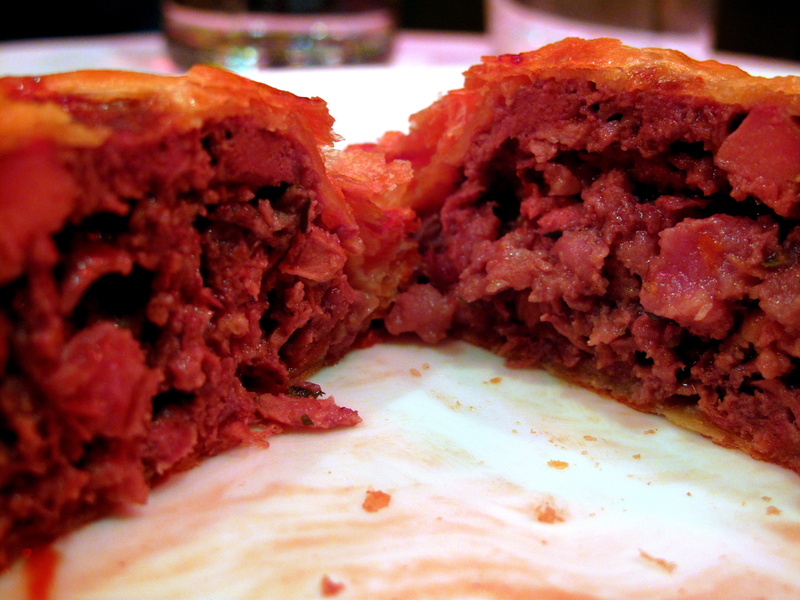 Rostang went on to start two more bouchons Lyonnais in addition to other less formal eateries, as did Savoy. There is, bien sûr, another side to this centime. In the early nineties, Gault Millau bestowed the ‘Bistro Moderne’ title on the movement that saw classically trained chefs from the country’s grandes tables abandoning their roots and launching their own traditional bistros. This transition was the result of the serious recession of the early nineties. Haute cuisine’s halcyonic heydays of the eighties had restaurants running over with willing young chefs ready to set off on their own; the economic downtown meant they had nowhere to go. Banks were unenthusiastic/unable to lend them the finance for expensive, fine dining restaurants, therefore those too impatient or too ambitious to wait for the fiscal tide to turn decided to scale back their schemes and settle for less costly ventures. These chefs differed from those like Rostang and Savoy in that they focused solely on these businesses rather than operating them in conjunction with more formal ones. Camdeborde was one of the impatient/ambitious ones. Although from a food-orientated family – his père, Jean, had a charcuterie in Pau whilst his grandmère, Marthe, owned a restaurant in nearby Navarrenx – this native of le Béarn was more interested in becoming a professional rugby player rather than a professional cook. It was his father that urged him to go to Paris and get some work experience there before deciding his future – ‘stay a year and then you can come home’, he told his young son. At seventeen, he thus found himself working at the Hôtel Ritz under Guy Legay (2*) and his sous, Christian Constant, in the French capital. Of the latter he says, ‘[he] gave me my professional education; I discovered my profession through him. I wasn’t born into it, I didn’t choose this…but it was my encounter with [him] that made me passionate about it. He was my master.’ Having found his calling at the Ritz, he then found Claudine, his future wife, who was at another restaurant, Capucine, close by. Like their peers, they dreamed of their own place, so whilst Yves worked his way through Maxim’s, la Marée and la Tour d’Argent before reuniting with Constant at the Hôtel de Crillon, Claudine studied business. In 1992, at twenty-eight and having just been awarded the Delice d’Or from Maîtres Cuisiniers de France, Camdeborde abandoned the space race for Michelin stars. 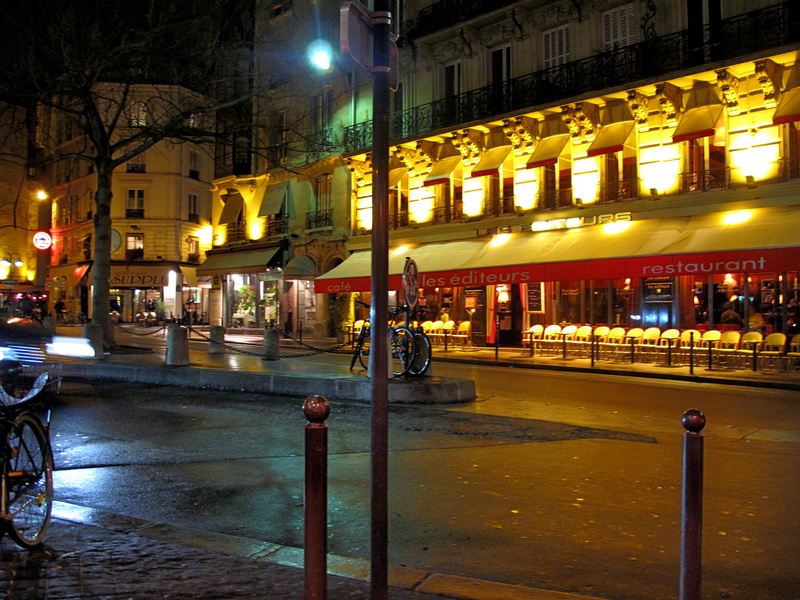 In line with his limited means, he bought a small café in the 14e and opened it as a bistro, la Régalade. A recipe of classic training, simple cooking, casual service and gracious spirit made this an instant success. It also became an inspiration to today’s generation of chefs bistronomiques including Stéphane Jégo (Chez l’Ami Jean), Benoît Bordier, Thierry Breton, Thierry Faucher and even his mentor, Christian Constant. By 2004, after twelve years at la Régalade, the man Constant describes as ‘like a battery’, had become exhausted and surprised everyone by selling his restaurant; ‘I wanted to move on before I got lazy. I needed to discover new things.’ It turned out that by ‘new things’, he meant the small, seventeenth-century Hôtel du Relais Saint-Germain, just off the touristy Carrefour de l’Odéon, which he took over the following year. This twenty-two room, four-star hotel became the focus of his and his wife’s efforts. 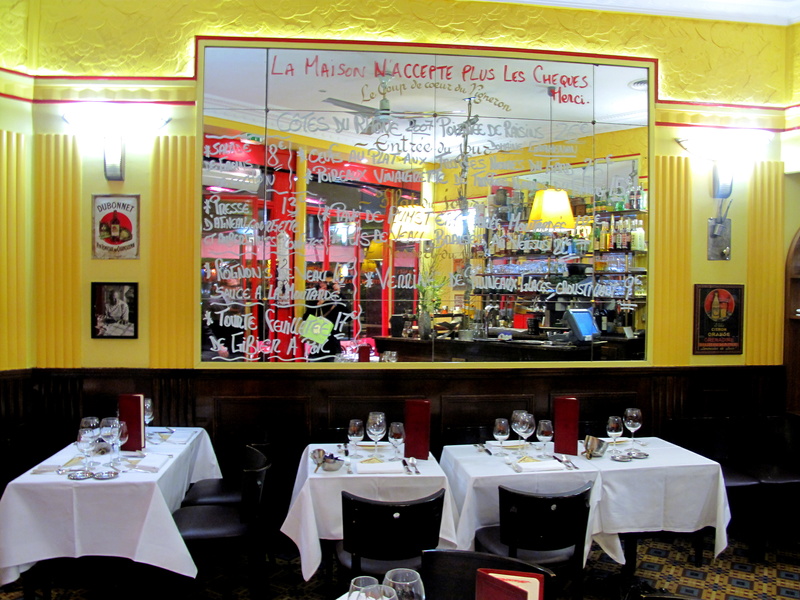 Once they were happy with it, Camdeborde was allowed to return to the kitchen, launching the adjacent ‘le Comptoir du Relais’. The couple’s mission here was to ‘appeal to all sorts of people; it’s magic when, in the same evening, in the same room, you’ve got Belmondo, Zidane, France Telecom employees, my rugby mates, upper-class americans, parisians – this creates true atmosphere. The client creates the atmosphere and the client needs to be relaxed. At the end of the day, it’s that simple. We wanted to perpetuate a French tradition of conviviality, but with a new, younger generation.’ The chef’s reputation has helped ensure that the dining room has been notoriously full since. 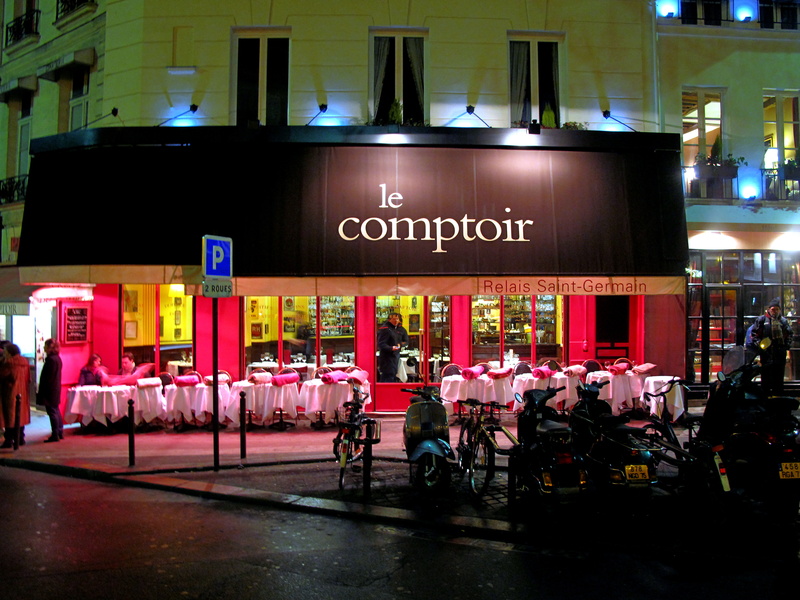 A bright red, sleek façade is almost entirely shaded by a vast, black, canvas canopy, upon which le comptoir is inscribed in white. 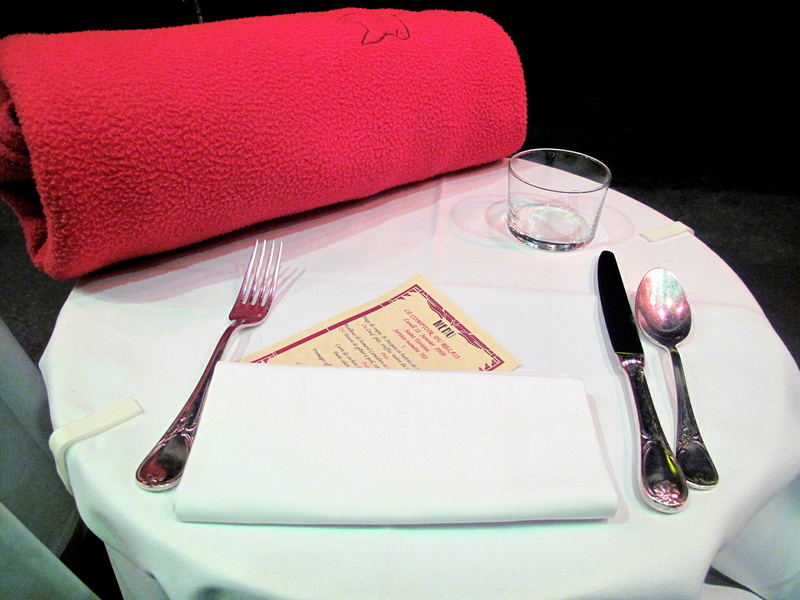 Before the tall windows, outlined with ebony and looking into the brighter, yellow interior, sits a line of little linen-covered cane tables for two, each with a wrapped scarlet/coral/peach blanket; an ardoise hangs on one side showing off the daily prix fixe menu. Inside, tables are tight together with a granite-countered bar on the right afore a large mirror, in front of which shelves, well stocked with colourful bottles and glasses, stand. On the opposite wall, amongst old adverts, a similar mirror is scrolled with the lunch carte. The art nouveau room has a yellow-blue mosaic-tiled floor. Dinner here tonight was an impromptu decision, so I had no booking. Turning up at half-past-eight, the dining room was full, but the terrace almost empty. It was a cold evening, but the blankets and huge heaters outside made it more than bearable and the view was a decent one too. During the day, the restaurant is an informal brasserie, but in the evenings, it is a gastro-bistro offering the same five-course menu to everyone. Each table has its own printed postcard detailing the dishes as well as the day’s patron saint – today it is that of Saint Tatiana, a Christian martyr from third century Rome, blinded, beaten and then beheaded. Le Pain: Pain de campagne. An entire, large loaf of crusty sourdough was brought out on a wooden board; the bread had been pre-sliced, but arranged to appear intact. Provided by Poujauran, it had a soft, fairly open crumb and slightly sour finish. Butter was not forthcoming. When asked for, two slivers of unsalted, fridge-cold beurre d’Isigny were delivered. Entrée 1: Oeuf plat truffes noires du Gard. 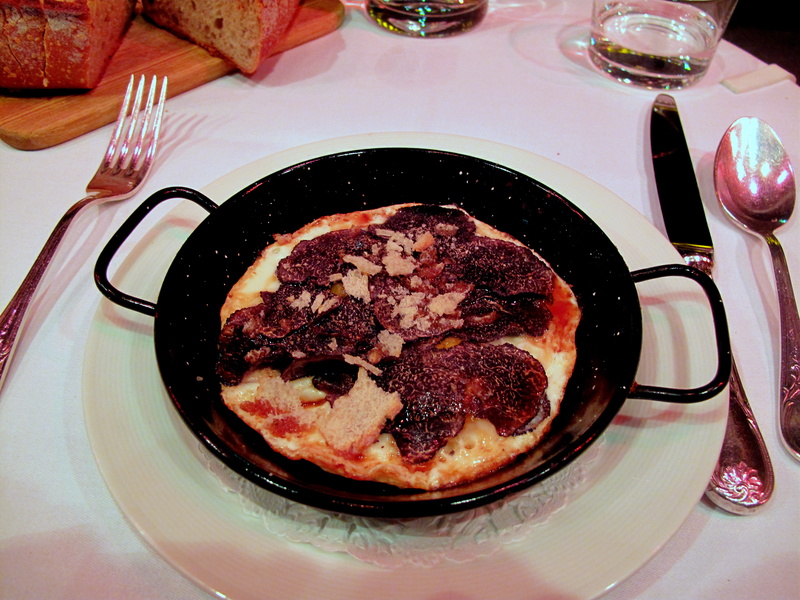 A sizzling hot, double-handed, cast iron roasting pan was served filled with several fried eggs, liberally overlaid with large slices of black truffle, coarsely-cut croutons and visible sprinkling of salty crystals. The familiar odour of the oeufs was at once noticed, unlike that of the truffles, which was noticeable only by its nonexistence. With creamy yolks and crisply-edged, wobbly whites, the eggs were well-cooked as well as well-seasoned, but the croutons on top lacked essential crunch. This was simple and pleasing as it was, but essentially it was a plate of fried eggs (that happened to carry a €15 supplement). Entrée 2: Moelleux de homard Canadien et pomme de terre ratte. Next to arrive was a bowl bearing an oven-baked, gold tinged surface, which when ruptured, revealed Ratte potato mousse, intermingled with morsels of Canadian lobster and interspersed with chives. Another agreeable aroma arose from this creamy mixture. The quality pomme, which also happens to be the suspected pomme of choice for Robuchon’s renowned purée, had nice flavour and surprisingly light consistency. This superior tatter was teamed however with inferior Canadian lobster that was sparse in supply and somewhat chewy. Plat Principal: Tourte de gibier à poil, cerises aigre doux. 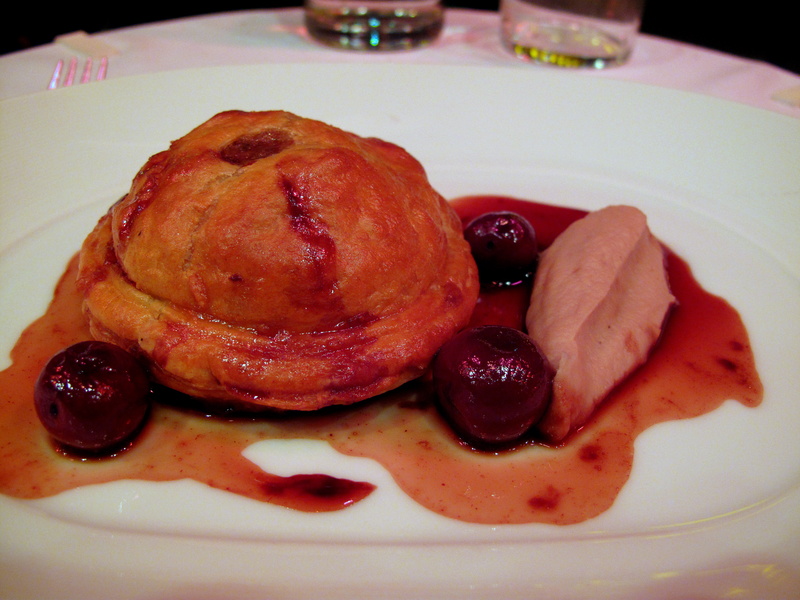 A pleasingly-sized game pie, densely packed with venison and hare and encased within thin pastry, was partnered with verjus-soaked cherries and quenelle of celery purée. The tourte was excellent – gamey, tasty, deep filling with crisp, light crust – whilst the delicate and clean celery on the side was an agreeable addition. The spicy cherries, unpitted and gritty, were just unpleasant; their verjus essence (acidic liquor from unripe grapes) was much too strong for the dish. Another letdown was the jus that came gently drizzled over all the elements. Although this was pleasingly strong, it was indistinct and had clearly started to form a skin. Les Fromages: Fromages affinés par la maison Boursault. 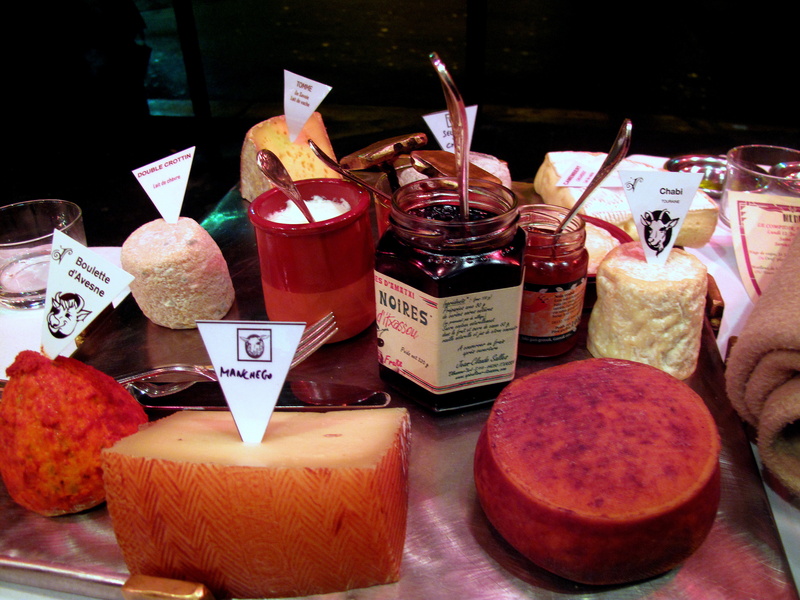 A big, shiny metallic cheeseboard, designed by Camdeborde’s friend Renaud Vassas, came burnished with ten sorts of fromage – St Marcellin, Echourgnac, Tomme de Savoie, double Crottin, Boulette d’Avesnes, Manchego, Chabichou, Camembert, Selles-sur-Cher and la caillé de brebis – in addition to jars of honey, gelée de piments, black cherry jam and a separate plate of pâte de coings. This generous, bottomless, help-yourself-to selection, supplied by Paris affineur Jacques Boursault, offered specimens from all over France and of both goats’ and sheeps’ milk. Interesting choices were a spicy, smoky paprika-wrapped Boulette from the Belgian border; a subtle Chabichou, the goat’s cheese that put Poitou on the map; earthy, grassy Tomme; and woody, nutty Echourgnac. The caillé, clotted cream from ewe’s milk, was watery, whilst my favourite was actually, the non-French Manchego from central Spain. This was slightly sweet, slightly tangy and formed a classic yet terrific couple with the delicious, grainy quince jelly (membrillo). 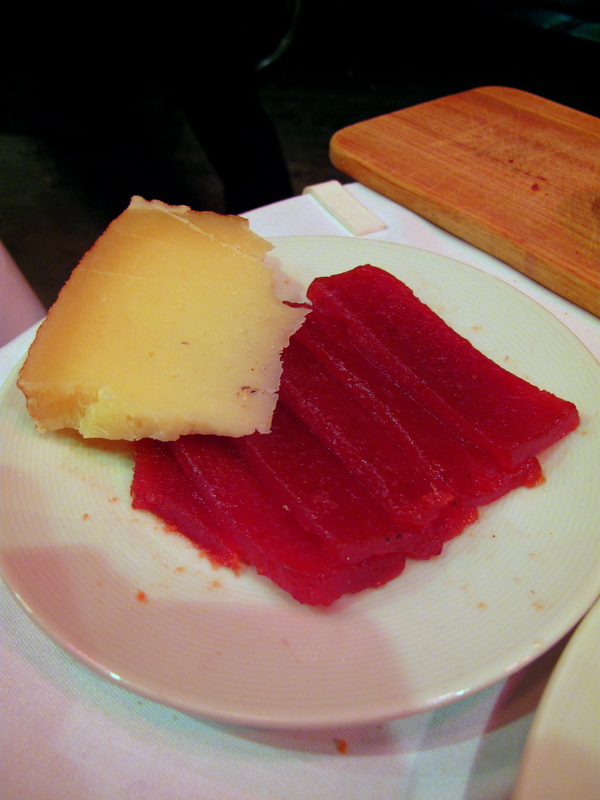 The Basque pepper gelée was also a curious and pleasant discovery. 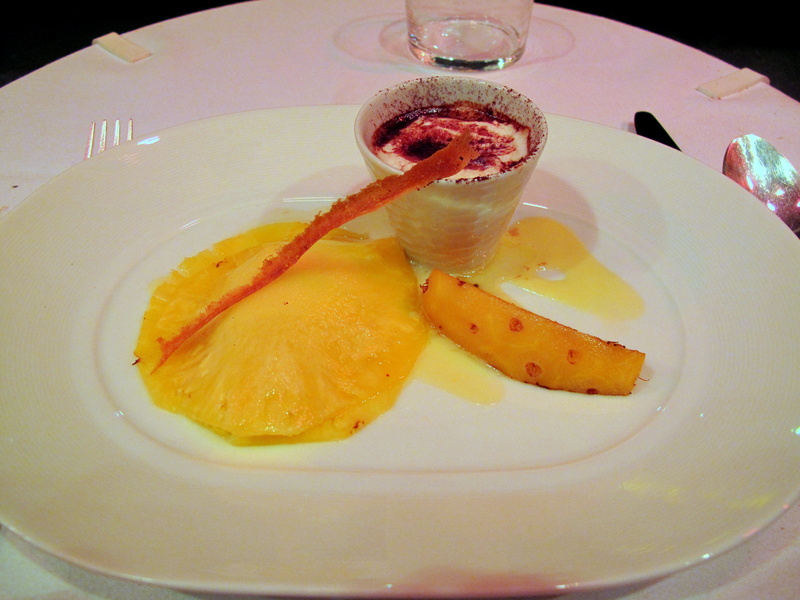 Dessert 1: Ananas Victoria en: Carpaccio, sorbet, rôti et cappucino. Pineapple four-ways was presented as two thin tranches of ananas cross-section sandwiching its sorbet and roasted almonds; a roasted fruit slice; and a small cup of pineapple juice, shot through with rum, topped with milky foam and dusted with chocolate powder. The Victoria breed – intensely sapid, sweet, but hardly acidic – is arguably the best. Cold carpaccio was simple and toothsome, although the sorbet within it had, on arrival, already almost completely melted away. The ananas rôti, moist, hot and crunchy, was good while the cappuccino, reminiscent of pina colada, was decent though unmemorable. Petit Fours: Caramel au fruit de la passion. A passion fruit caramel, with plenty of fruity-tartness, was gratefully neither too sticky nor chewy. Service was adequate. There was just one serveur to be shared between all those on the terrace with only another two within, making getting anyone’s attention at times trying. The waiter, who looked after me, was friendly, interested and helpful when I was able to gain his notice; he also spoke excellent English having lived in London himself a little while. However, I was made to feel a little rushed with the all-you-can-eat cheeseboard, which I did not appreciate. Yves Camdeborde, having greeted guests and wished them bon appetit before dinner, came out into the dining room and onto the terrace towards the evening’s end. He spoke with most of the diners and indeed seemed well-acquainted with many. I must say that I was not impressed with the food. 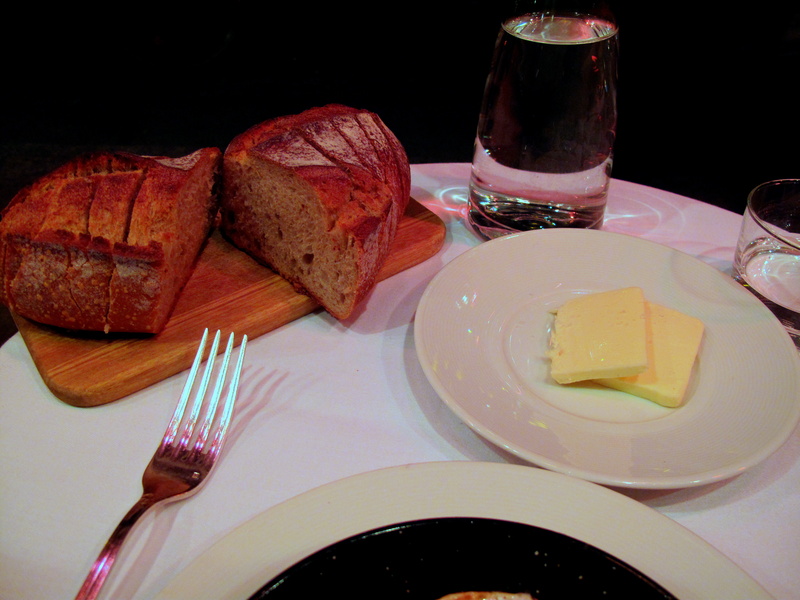 I do like my bread, so a whole loaf to myself was a fine start to the meal. However it was ruined by a first course that verged on absurd with utterly useless truffles making it, effectively, the most expensive plate of fried eggs I have ever had; consummately cooked eggs they were though. The moelleux de homard was, to a degree, a decent straightforward dish, but slapdash plating (notice the smears left along the edge) and mediocre products made this forgettable. The game pie was far and away the best item of the night and was actually very good in its own right, but again, as a dish, it was spoilt by disagreeable (and out-of-season) cherries and stale sauce. As a complete course, the cheeseboard was the most satisfactory and, as none of it was the fruit of the kitchen, this says much in itself. The dessert too was unremarkable. The general theme was one of simple yet luxury ‘comfort food’. Fried eggs smothered with truffle, moelleux made with lobster and a pie stuffed with noble venison and hare certainly live up to this billing. A good idea though was foiled by execution and raw materials that were found wanting. The play on different textures of pineapple and the tourte hinted at an haute education, but there was none of the innovation or creativity that Camdeborde has been credited with. There was instead a basic sloppiness that was rather off-putting. As mentioned, the poor truffles; dirty presentation; dishes probably waiting at the pass (the jus’ film) and sorbet served on a hot plate, were all evidence of this. Any good ingredients, such as the game, Ratte potato and Victoria pineapple, also appeared to be cancelled out by second-rate ones like the Canadian lobster, again impotent tubers and those cherries. Although lunch is supposed to be an altogether rather different and much more rewarding experience, I have read and heard from others that dinner is no longer worthwhile and that, moreover, Camdeborde’s cooking is not what it used to be. Actually, the consensus seems to be that he has never been able to reach the heights he did whilst at la Régalade. I, never having tried his cuisine there or before at all, cannot comment on such. What I can state though is that the sense I got was one of a chef who has stopped trying. There was none of the attention to detail or finesse that I would expect from someone trying to impress. Cynically, what with Camdeborde’s other business ventures and a name that ensures that his restaurant is full regardless of what he serves, maybe he has deemed his efforts surplus. As an aside, when he stepped out to check on customers after service, I did notice how impeccably clean his whites still were as he spoke to the elder couple besides me. Something else absent was the legendary generosity that the chef helped establish himself with. At la Régalade, patrons were plied with complimentary pâtés, terrines, sausages and hams made by his brother, Philippe (a custom that continues there today). At le Comptoir, such munificence was missing; even with the ‘limitless’ cheeses, I felt my time limited and though I did see vegetable crisps waiting on tables inside and observe other guests outside given nibbles and wine prior to their starters, I personally received nothing. In their defence, these canapés consisted of jambon and pâté en croûte, obviously both containing pork which I did tell the house I did not eat. Whether I did not receive these because of my ham abstinence, I do not know, but no replacement was forthcoming. 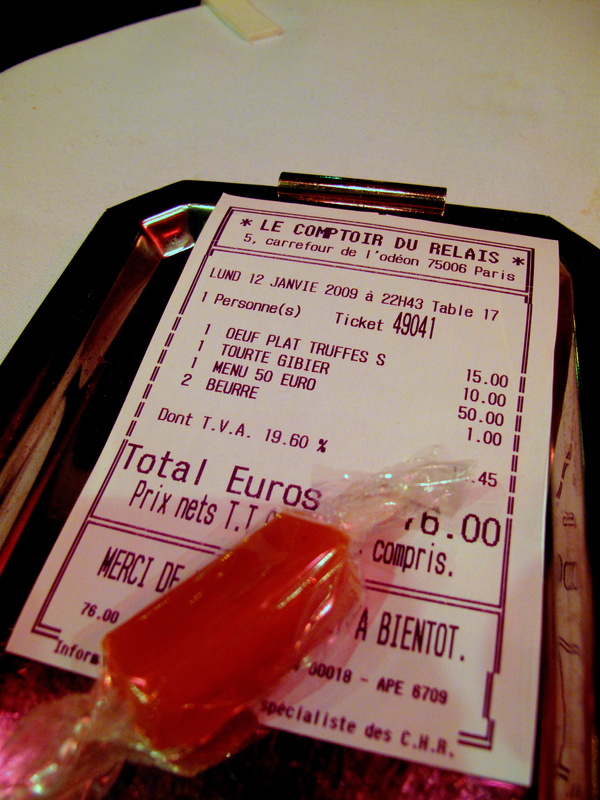 Possibly the biggest and worst indication of the lack of liberality was the fact that I was charged a supplement for the butter – yes, a supplement for butter, in France. 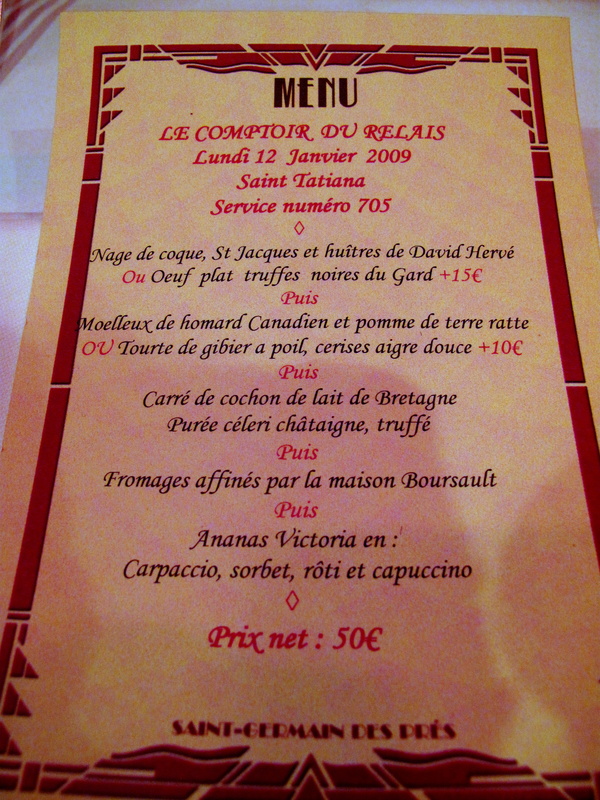 For the record, the date of my dinner at le Comptoir was 12th January. Don’t you get lonely, eating at empty table after empty table? I share your enthusiasm for piment d’espelette jelly (assumning that’s what you had). I bought a small jar last time in Paris at someplace on Boulevard Saint-Michel whose name escapes me right now. However, although admittedly some may find it depressing/boring/awkward to eat alone, I guess I am just comfortable enough with myself not to. A: Indeed, espelette jam. yum. Based on reviews on your blog (which I’ve very much enjoyed, by the way) and others, I’m sometimes surprised so many people bother serving/ordering truffles; they seem to be disappointing about 75% of the time! Is it a relative thing, i.e. if you’ve never had them before you’ll notice the taste, whereas if you’ve had them many times the flavour will stand out a lot more on a few occasions? Otherwise they seem like a very poor investment. Personally, I think the restaurant should not serve any item if it is no good – but then again, because they are a luxury, ‘wow’ item, people will always want to order them. Thus it makes business-sense to offer them – which can be difficult to resist. The problem here was that truffles were generally poor this season. This was no excuse for offering/promoting them however. Sorry to hear your dinner was a little lacklustre. I had lunch here last summer (also settling for a terrace table due to the crowded dining room) and enjoyed a very good terrine de foie gras, a rich and pungent stew of joue de boeuf and a tidy little pot au chocolat; which, I guess, corroborates what you have already heard about lunch vs dinner. Thanks for the confirmation and I am at least pleased that you enjoyed your lunch! Thanks for the tip, I plan to look into it. You have stumbled across a great site – Julot is an amazing source, a real ‘bible’ and I am lucky to be able to call him a friend. Completely agree about l’Ami Jean too! We went there a couple of times after taking kids to jardin de Luxembourg, after having read about it in the Clotilde’s Edible Adventures in Paris during the week of July 20th, 2009. Both times we showed up with two little kids (one is 5 and the other merely 2), at around 2 – 3 PM, and on both occasions found the food very very good. 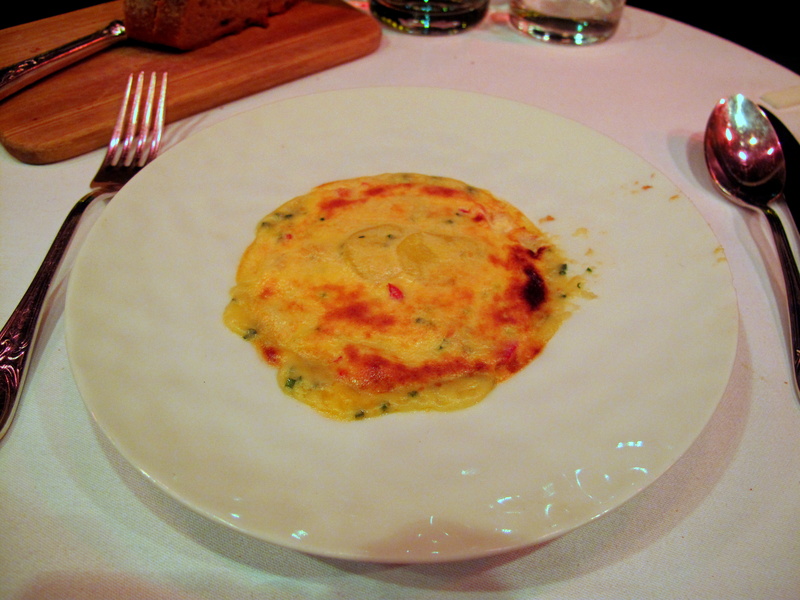 Having coming from California and fans of Thomas Keller’s French Laundry, our expectation of French food was high. The cheese assortment and the dessert were hits for our kids. For two Americans who did not speak much French, we were able to navigate the menu OK, and the service was efficient. Also, found surprising number of Americans eating there during these off hours. Will definitely go back again with the kids. i thought your review was spot on. i visited back in december last year and was slightly disappointed, the service was surly (i guess only to be expected and endured with good-humour), but unforgiveably pushy and even more unforgiveable was that the food was passable and two bottles of wine were corked. maybe it was the day we went, it was VERY busy, snowing outside so it was full to bursting inside; maybe it was because we were dithering; maybe it was just bad luck. i don’t know, but i do know i was singularly disapointed. @afacadeofniceness you’re experience sounds significantly worse than mine! I hope you at least had better meals whilst in Paris to help you get over it. I’ve always enjoyed the food at Le Comptoir—it’s the first place i stop at when I arrive for my fix Brandade du Moreau. A bit pricy, sure, but I’ve never been disappointed. @Sean Reading over the comments above, you are not alone. I assume you go for lunch? Only dinner. During the day I’m in the markets looking for things to cook or being dragged around town. My girlfriend thought I was nuts for bringing my knives (we stayed at a friend’s flat in the 6th near St Germain) but changed her mind once she had the poulet de Bresse ($$ little buggers) and a pintade. I wanted to get to Comptoir because of its history. 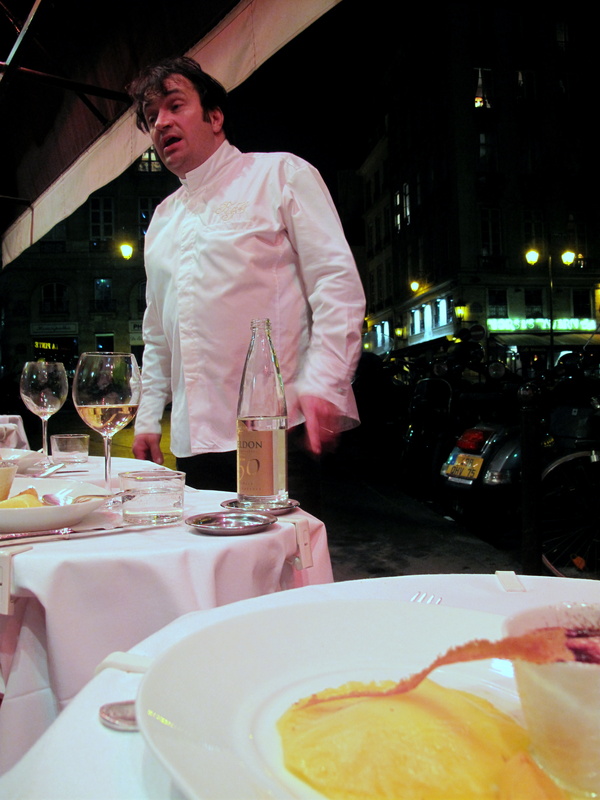 Last year I met the chef and in my mangled French thanked him for the meal. @Sean Ahh, right. I assumed lunch as you mentioned the brandade so I thought it an item on the lunch menu rather than the ever-changing prix-fixe at dinner. 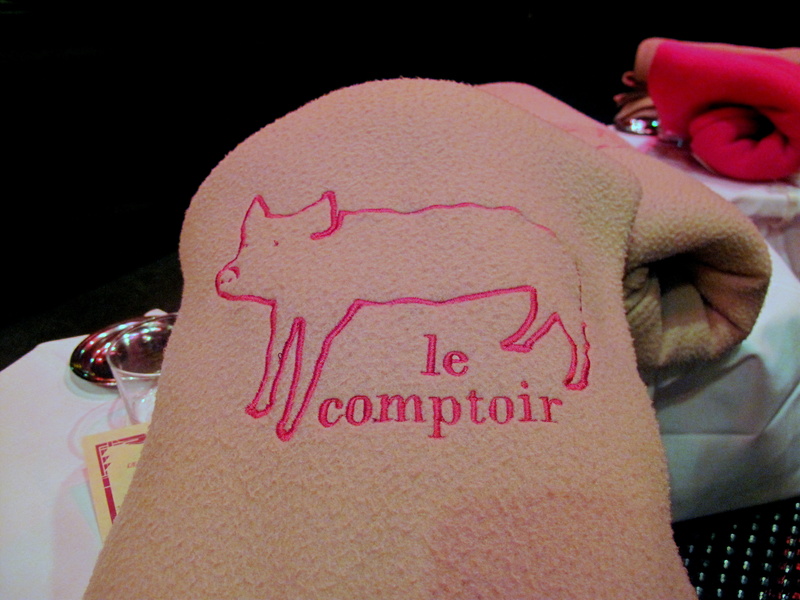 We just returned from our trip yesterday and Le Comptoir is still at the top of my list. I cannot resist ordering the Lievre a la royal. It is superb! I also had a very tasty entree of cream of chestnut soup this year. Not to mention the amazing wine list and killer cheese selection. Yes the service can be a bit rushed…but they are always very friendly and if you’d like to linger you most certainly can. I guess maybe i’m used to this as I live in NYC and most popular restaurants are similarly paced. It’s unfortunate that you dont eat pork b/c i feel that some of my favorite dishes here have been pork. Anyway, I would give it another try. Only because im such a fan and cant seem to imagine anything being bad there! Maybe it was an off night. They charged you for the butter? !